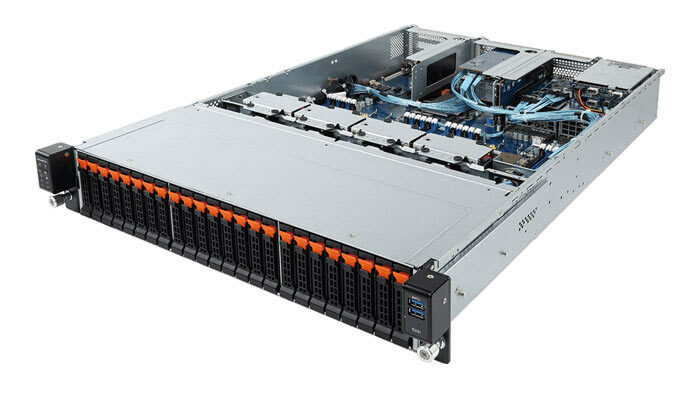 Today Gigabyte has launched a range of Intel Xeon Scalable rack servers and a pair of Intel Xeon Scalable server motherboards hot on the heels of Intel's processor and platform launch. In an email to HEXUS, Gigabyte echoed Intel's message of the new scalable platform providing compute, network and storage solutions for any application - from the enterprise to the data centre to HPC. Gigabyte says its new product offerings take advantage of the performance benefits that Intel has built-in to target a range of segments. In particular, these rack servers target enterprise and cloud applications, with extensibility for advanced future HPC applications. The eight servers that are new to Gigabyte's lineup make the most of the increased memory capacity, increased memory bandwidth, and innovative storage (Optane) and networking (Omnipath interconnect fabric) now available. The new range of servers is optimised for high TDPs and are "thermally designed with the highest rated bins in mind so that performance is impressive whichever Xeon Scalable CPU you choose," says Gigabyte. Furthermore, you will find the servers feature high density add-on slots, modularised backplanes, RoHS July 2017 adherence, and a tool-less design. There are eight new servers in all with four new 1U-form factor, and four new 2U-form factor systems. The full range of servers is listed and summarised here with click through links for further information. 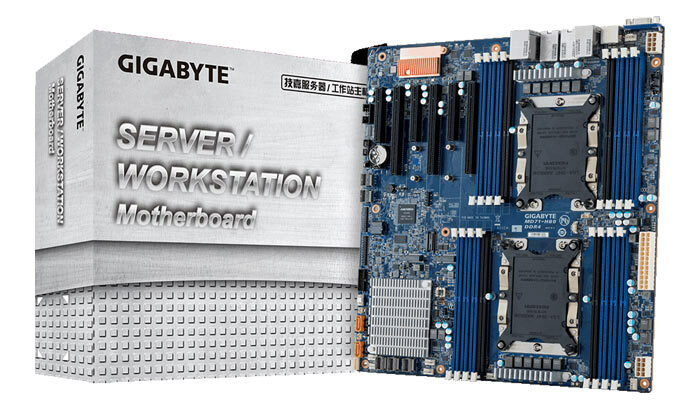 Gigabyte also launched a pair of new motherboards, supporting the Intel Xeon Scalable series offering up to 28 cores and 48 PCIe lanes per socket, the MD61-SC2, and the MD71-HB0. This is the first wave of releases supporting the Intel Xeon Scalable processors, Gigabyte will shortly be releasing some GPGPU and 2U, 4 node systems based upon this architecture. Off*Topic* Old question: I am amazed with social media sites like Google+ and with the big fan base they have, millions of posts every second. How does the thousands of interconected servers across the globe work together to give a feel that when I am posting on G+ it is as if I am posting to only one server but in reality thousands of servers across the globe are handling that single post of mine? And how do they work together to avoid data confusion? Considering the google caching servers are the ‘front line’, giving the feeling of single point access… bear in mind there is a vast array of machines on the next level and beyond. Obviously it's all wizardry… but in simple terms it's localizing traffic by your IP… a request comes in and it's routed to the nearest (likely by ping/hops rather than geographically) caching server. These new(er) offerings are all well and good.. but in real terms has the tech really moved that far in the last 5 or so years? My first reaction is.. not a great deal. On price/performance I am considering 2 x hex core L5640s (biggest workload will be an exchange server) and I can't see the point buying new when you have so much ex-enterprise gear in the market that is well supported by spares. I can get 24 threads, 100GB ram and 8TB of raid for just over £1K which is nuts. I'd be very interested to hear thoughts from those in a similar position or have been buying off the shelf recently. I can get 24 threads, 100GB ram and 8TB of raid for just over £1K which is nuts. I am also in a position where I need to upgrade the hardware for around a 6 server system and buy new servers for Lab environments and I will be looking forward to this release because the second hand market will be flooded. On a side note, where are you seeing the 12c24t-100GB RAM and 8TB Raid for? Closest price I can see for that is £2k!! !